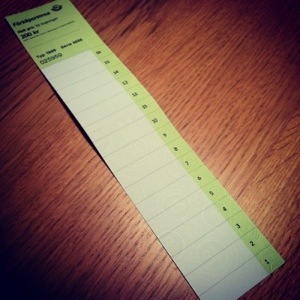 Today, for the first time in like “forever”, I used the old paper ticket used by the Public transportation company in Stockholm. They put a stamp on the ticket depending on how many of their zones you travel in. If I only travel between home and the central station this ticket will last eight journeys for me. I don’t usually use this type of ticket while traveling by public transportation. Either I get a monthly access card or one valid for a year. My yearly pass was valid until last Friday but as I won’t travel as much in Stockholm right now it was not worth it to spend the money. This type of paper ticket is only valid until New year’s after that it’s the access card you have to use (or SMS ticket). I had planned to prepay a certain amount this time already but when I asked Mathias to buy it for me I knew they charged for new access cards I thought this type of ticket would work just fine for now.